APMI is seeking a REVIT Designer to join our growing firm at our Scottsdale office. APMI has been in business since 1984 and our projects include municipal (State, County and City levels), higher education, retail, corporate office, manufacturing, restaurant, and financial work. Our diversity of clients and project types provide a vast array of project experiences. APMI is seeking a REVIT Designer with skills and experience to join our collaborative team. APMI is seeking an individual who is detail oriented with a knowledge or desire to learn various construction methods. Our work culture is a collaborative, ego-free environment which fosters personal and professional growth. It is important to find the person with the skills and personality that best fits our firm culture. Please submit cover letter, resume and work samples via email only to: apmi@apmi.com. APMI is an equal opportunity employer. APMI is seeking a Project Architect to join our growing firm at our Scottsdale office. APMI has been in business since 1984 and our projects include municipal (State, County and City levels), higher education, retail, corporate office, manufacturing, restaurant, and financial work. Our diversity of clients and project types provide a vast array of project experiences. Our work culture includes a collaborative, ego-free environment to create dynamic and unique designs. It is important to find the person with the skills and personality that best fits our firm culture. Your past experience is not as important as the skills and energy you bring to the team. Award winning firm with US and international work seeks professional with excellent skills in networking, identifying and responding to proposals, arranging marketing meetings for principals. Must be confident, show initiative, quality-control and follow-through in working method. Skilled production / coordination of marketing and proposal documents essential. Role may include design of environmental graphics. Accepting resumes from individuals skilled in marketing or graphic design independently. BWS Architects is seeking a registered Project Architect with 5-10 years public work experience to work as part of the team in our Phoenix office. Strong technical and computer skills are required including REVIT and Adobe Creative Suite. Responsibilities will include consultant coordination, development of construction documents and construction administration. Candidates should have project management skills, the ability to manage multiple projects and be self-directed. Candidates should have great communication and client relations skills. BWS Architects specializes in public and community projects. We have been recognized for quality service and design excellence, having received the AIA State of Arizona Firm of the Year Award for 2014. BWS Architects is seeking a Project Coordinator / Graduate Professional to work as part of the team in our Phoenix office. Position consists of working on project teams to support design development and the production of construction documents with Design Principal, Project Managers and Project Architects. Position offers substantial growth opportunities, potentially evolving into a Project Architect role contingent on your successful completion of the registration process. Candidates should possess project organization skills, the ability to manage multiple projects and work in a studio environment. Design ability is desirable. Our firm provides high quality design in an energetic and fun workplace. We work in an open studio environment on a variety of project types and sizes from restaurants and single family homes to large, multi-story, urban mixed-use projects. We are also Architect Developers and have multiple development projects in our portfolio with three projects currently in-progress. Award winning firm with US and international work seeks Project Manager / Project Architect with excellent skills in construction documentation, communication. Award winning firm with US and international work seeks mid-level Architect or Intern Architect with excellent skills in construction documentation and communication. Must be confident working in teams; show initiative, quality-control and follow-through in working method. Skilled production / coordination of documents essential. -Min. 3-5 years’ experience, commercial architecture. Creo Architects is a growing architectural firm working on a variety of Commercial, Industrial, Tenant Improvements, and Custom Residential projects. We are looking for a full time,Architectural graduate with 1-3 years’ experience, who is organized and focused with strong design, graphic and presentation skills. Applicants must have an ability to work with consultants and clients. Candidate must be curious and a creative thinker who is looking for opportunity to grow and participate in all phases of architecture. Proficient in Autocadd, Photoshop, In Design, Sketch Up, and computer troubleshooting. Provide resume, references, examples of construction documents, design and graphic ability. Corgan is actively recruiting a Project Architect to join us in our Phoenix office location as part of our Interiors market sector. Our firm offers unique opportunities for both personal and professional growth by offering a wide-range of project responsibilities and team leadership roles. Visit us at www.corgan.com/apply for a full job description and to submit an application and upload your resume and portfolio. ADM Group Inc. is an architecture and interior design firm in Tempe, Arizona. We have provided architectural, interior design and project management services for 25 years in the Education (K-12), Municipal and Corporate markets. We are looking for an Admin Assistant for Project Support and backup receptionist. Requires 4 years experience with excellent knowledge of MS Office. Familiarity of AIA contract documents and SpecLink beneficial. Experience in architectural or construction firm also helpful. We are looking for an Interior Designer to work with other team members to produce construction documents and detail design elements. 3 to 5 years’ experience with high level of proficiency in Revit required; plus AutoCAD, PhotoShop, SketchUp and Lumions. Our focus is to find typologies for the next generation of cities and social environments. Knowing that technological disruption will change even more how we live, work and play. At the core of our culture is DESIGN THINKING to deliver creative solutions, working as ONE TEAM putting people first. DLR Group has openings for Project Designers in Phoenix. Collaborate with Project Managers to support client needs of the project. DLR Group has openings for Project Architects in Phoenix. Collaborate with Project Managers to support client needs of the project. Poster Frost Mirto seeks two self-motivated Architects or Design Professionals for immediate placement to assist with multiple projects. Minimum of three (3) years of office experience after B. Arch. Poster Frost Mirto is an 8-person firm located in a historic adobe in downtown Tucson, AZ. A 10-minute walk from the street car and in the heart of downtown. It is a special place. Our work includes Historic Preservation, Workforce Housing, Non-Profit & Institutional, Urban Design, and Planning. ARCHSOL, LLC is seeking an Intern Architect in Scottsdale, AZ to join our team. This is a great opportunity for a highly motivated individual to learn healthcare architecture and work in a team environment. Ideal candidate would have 0-3 years of experience with a degree in architecture. ARCHSOL, LLC is seeking a Project Architect to join our team in Scottsdale, AZ. Ideal candidate would have experience in healthcare, Revit, producing quality construction documents, and completing projects from preliminary design through construction and occupancy. ARCHSOL, LLC is seeking a Healthcare Designer to join our team in Scottsdale, AZ. Ideal candidate would have a combination of strong Revit experience, technical architectural and design competence, and experience providing full document support to the project team from schematic design through construction close-out. ARCHSOL, LLC is seeking a Marketing Coordinator to join our team in Scottsdale, AZ. We are looking for a talented individual who shares our commitment to design excellence, enjoys working in a team environment, and demonstrates a high degree of creativity and enthusiasm. ARCHSOL, LLC is seeking a Project Coordinator to join our team in Scottsdale, AZ. We are looking for a talented individual who enjoys working in a fast-paced team environment to provide full support to the project team delivering successful new construction and renovation projects. Swaback is looking to grow and is seeking an architectural design professional. This is an excellent opportunity for individuals who welcome responsibility and are looking to develop their professional skills in a highly creative environment. Experienced with Revit, AutoCAD, Adobe Creative Suite, and SketchUp. Swaback is a team of dedicated professionals providing award winning commercial and residential architectural design, community development, land planning and interior design services. Located in Scottsdale, Arizona, Swaback was founded in 1978 and practices throughout the United States and Internationally. We have the depth of design skill and experience necessary to achieve any vision in any location. Swaback offers a competitive salary and a comprehensive benefits package including: Medical, Dental, Group Life, 401k Plan (Matching) and PTO. Marlene Imirzian & Associates Architects is seeking a full-time Senior Designer to join our Phoenix studio. for continued project quality efforts. Marlene Imirzian & Associates Architects is a full service architectural firm known for its design excellence, project performance, and as a leader in integration of sustainable design practices. To be considered please email your resume to dmonaco@imirzian-architects.com. No phone calls please. Comments Off on New AIA AZ Website! How do you think about borders? An edge or boundary? Is a border a line that divides or connects? Are borders helpful? Necessary? AIA Forum wants to explore the idea of borders–not just political boundaries and what they mean within a state that depends on the connection between two countries–but the lines we draw in our daily lives as we work as architects and designers. Share your expertise, your reflections on architecture, or what inspires you. We want to hear your voice. AzF is soliciting member participation in two key areas–as peer reviewers and as contributors–for the fall 2018 issue themed “Borders.” Articles are typically 1500 words. AIA Arizona was chartered June 30, 1937 and we are celebrating it’s 80th Anniversary! We will have food and drinks and a lot of storytelling. There will be photos from the 8 decades. If you have any photos that you would like to include – please forward them to Tina. We will recognize all of the Past President’s in attendance at 6:00 pm. Please let us know if you have any questions. Email Tina or phone 602-252-4200. We hope to see you on December 1st! 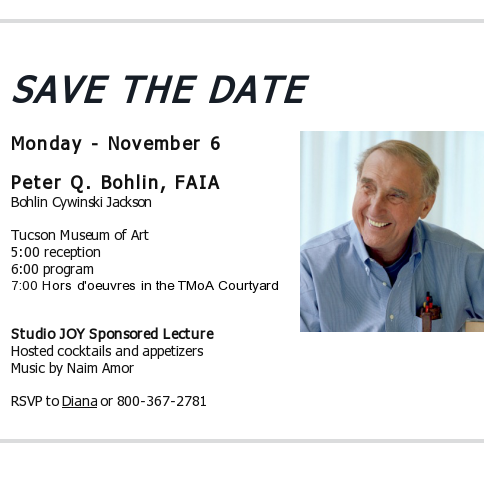 Join us for the AIA Southern Arizona Holiday Mixer! RSVP: Learn more & RSVP by December 1st here! 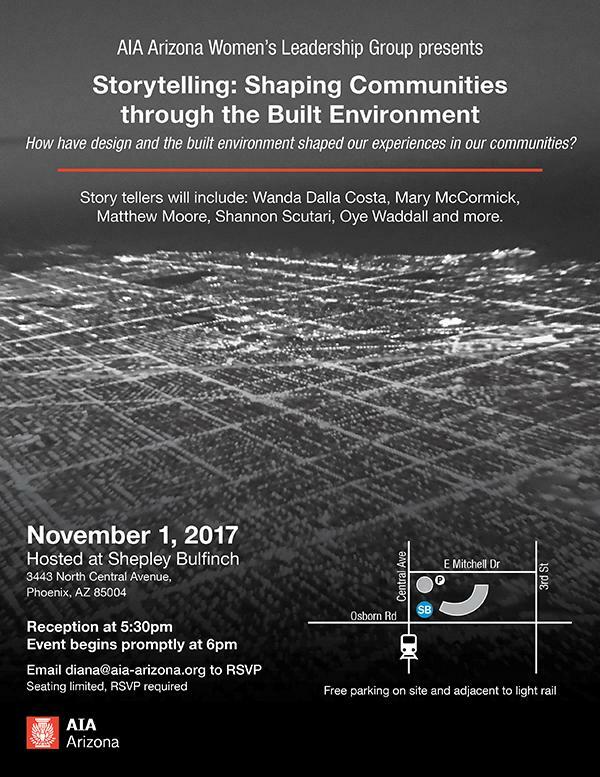 Join AIA Phoenix Metro for their 2017 Annual Meeting! RSVP Required: Learn more & RSVP here! Click here to see boards from the five finalist and vote for People Choice! Celebrating the best in Southern Arizona Home Design. 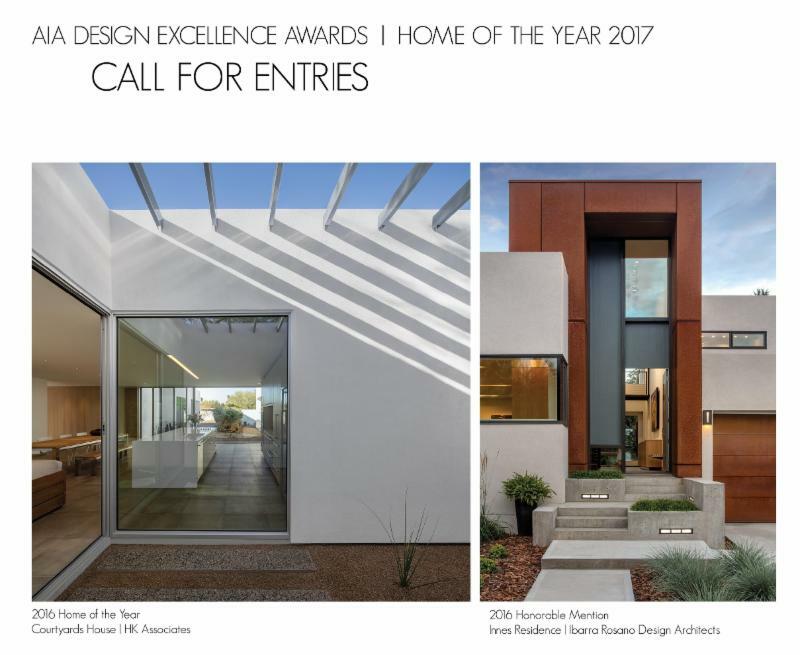 Sponsored by the American Institute of Architects Southern Arizona Chapter and Tucson Lifestyle Home & Garden Magazine, this competition recognizes the best home designs in Southern Arizona. Judging will be based on design quality, inventiveness, and response to the Sonoran climate and setting. AIA Phoenix Metro INFILL Phoenix Design Competition! Questions—Contact Diana via email or 602-252-4200 for further information. This course will identify the benefits of accessibility standards and the prescriptive requirements for accessible restrooms set by the ADA, the California Building Code (CBC), and the Arizona Building Code. Parking will be validated for the City Hall garage located at the southwest corner of 3rd Avenue and Washington. Connect with Charnissa via email or call 602-252-4200. *Please Note: 24 hour cancellation notice must be given for refunds all no-shows will be billed. AIA Arizona is excited to host the 2017 AIA Arizona Awards Gala at the Phoenix Art Museum! Join us and celebrate with friends and colleagues! Tickets for the Awards Gala are $95 each until Friday, September 29th; the price after that date increases to $125 each. The jury meets on September 6th & 7th in Mexico City. Winners will be notified the week of September 11th. AIA AZ NOMA Conference Grant for Emerging Professionals–Deadline EXTENDED! Apply for the NOMA Conference Grant! To support minority emerging professionals in our community and further the conversation regarding equity in our profession, AIA Arizona is offering a grant for one AIA10, Associate, or AIAS member registrant to attend the National Organization of Minority Architects (NOMA) 45th Annual International Conference & Exposition. This grant will cover up to $2,000 (maximum) to be used by the one selected individual towards NOMA’s 45th Annual International Conference & Exposition registration fees, airfare, rental car/ground transportation, and hotel expenses. Expenses will be reimbursed once reporting activities are complete and receipts are received by AIA Arizona. For those that do not meet the eligibility requirements, please encourage the AIA10, Associate, or AIAS members in your firm/circle of friends to apply! All of the above information must be e-mailed in a single PDF file not exceeding 5mb in size to Mike Anglin, AIA by 11:59pm MST on September 17, 2017. Comments Off on AIA AZ NOMA Conference Grant for Emerging Professionals–Deadline EXTENDED! We will be closed Monday, September 4rth, in observance of the national holiday. Normal hours will resume on Tuesday, September 5th. 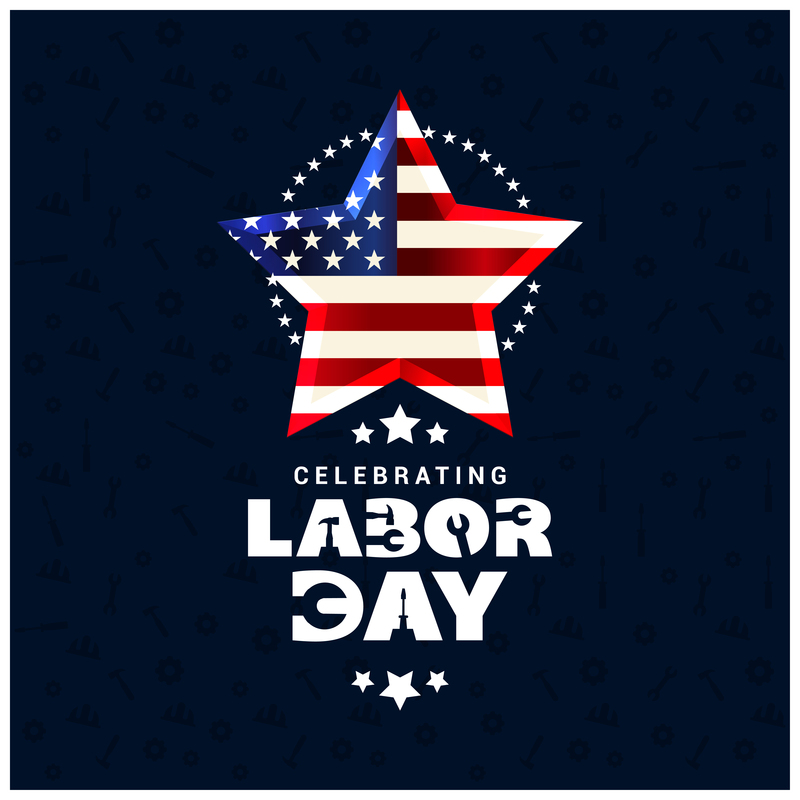 Hope you and yours have a safe and wonderful Labor Day weekend!